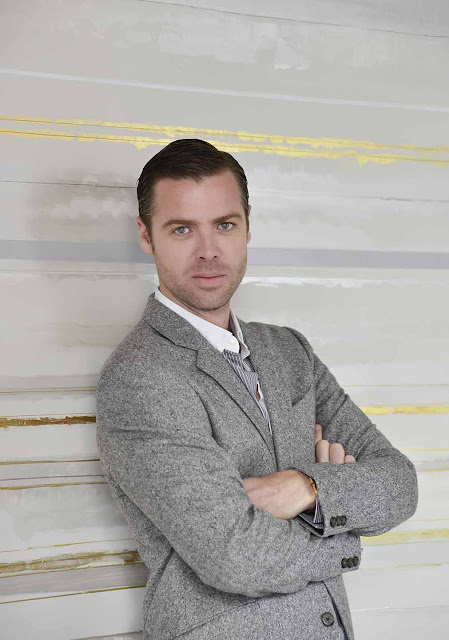 Jean-Louis is the all-time favorite interior designer/architect of the global readers of THE STYLE SALONISTE (and The Style Saloniste). 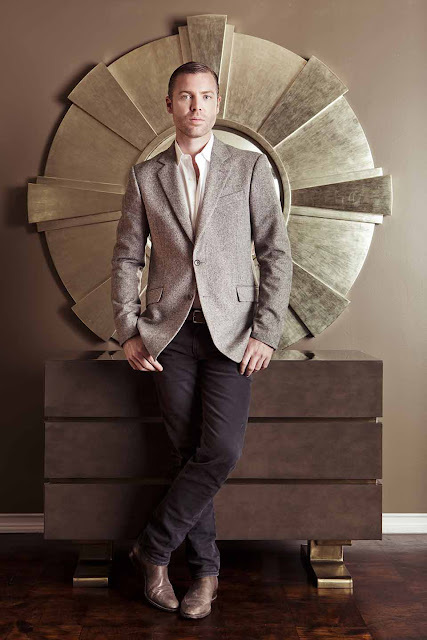 He’s at the top of A lists and ‘best’ lists of global style and design editors. Russian AD devoted a jumbo issue to him and his work last January. His career spans two decades. 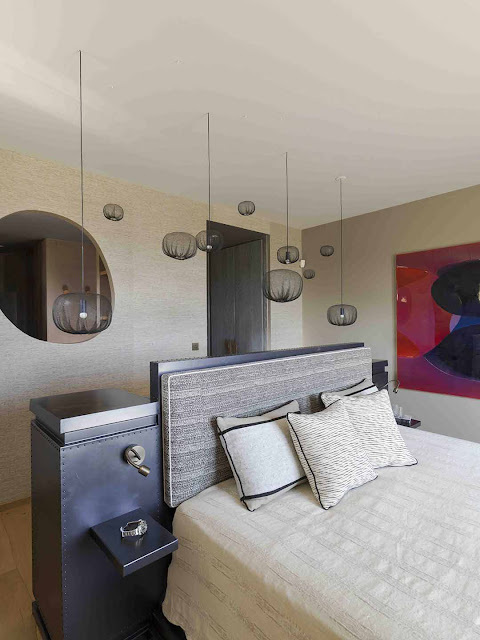 The Cabinet Jean-Louis Deniot team is based on the chic rue de Verneuil. Projects encompass a broad diversity of work including penthouses in Manhattan, residences from Beverly Hills and San Francisco to Miami and Caracas and Delhi. On his roster: Kiev, Moscow, Monaco, Senlis, Capri, Tangiers, London, Chicago, Chandigarh, and Corsica, among others. He’s always on a plane. And he is always brilliant. This week I’m celebrating the one-year anniversary of ‘Jean-Louis Deniot Interiors’, which I wrote. It covers more than thirty interiors and is his first monograph. It was published last fall by Rizzoli. I collaborated very closely with Jean-Louis on this book and it’s been a great success. It was sold out even before it was published, and has gone swiftly into the second of many printings. Image above, with a crystal box by Alexandra von Furstenberg from the Jay Jeffers Studio, was shot in my library on my iPad. This time last year, Jean-Louis and I were on a fast-paced book tour around the country…from San Francisco (hello, Will Hearst) to Los Angeles (hello, Cliff Fong) and Houston (Chateau Domingue and dinner in the garden) and Chicago (hello, Marla and Fred and Jane) and later to Manhattan (hello, Marco and Jamie and the Rizzoli team). And then Jean-Louis created a surreal ball in an historic palace in Paris, with leather-clad revelers frolicking and glamorous girls tripping the light fantastic. Departing at 4am in a light snowfall added to the allure. All the while, Jean-Louis was dreaming up new interiors. 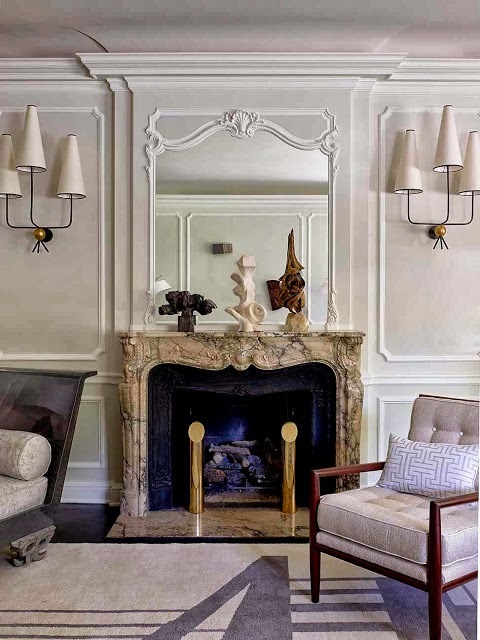 ‘Jean-Louis Deniot Interiors’, with principal photography by Xavier Béjot, was includes houses in Paris, Chantilly, the Touraine, Chicago, Manhattan and Los Angeles. 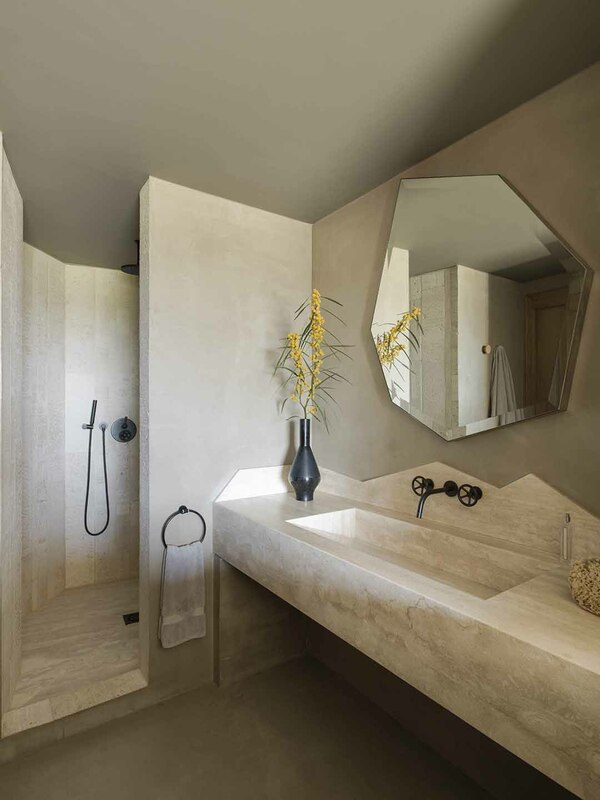 It focuses on the range of his interior architecture and décor. 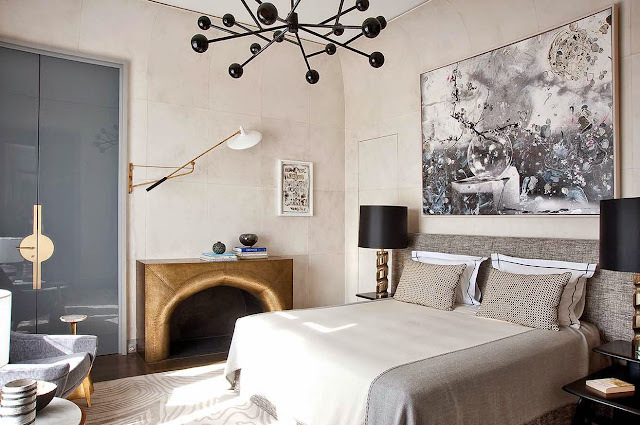 There’s an art-filled penthouse near the Eiffel Tower, and a jewel-box apartment on the Left Bank, as well as his country house near the Chateau de Chantilly, and his new apartment on the rue de Lille, with a kitchen featuring hand-hammered silver cabinet doors that are perhaps the most copied in recent memory. 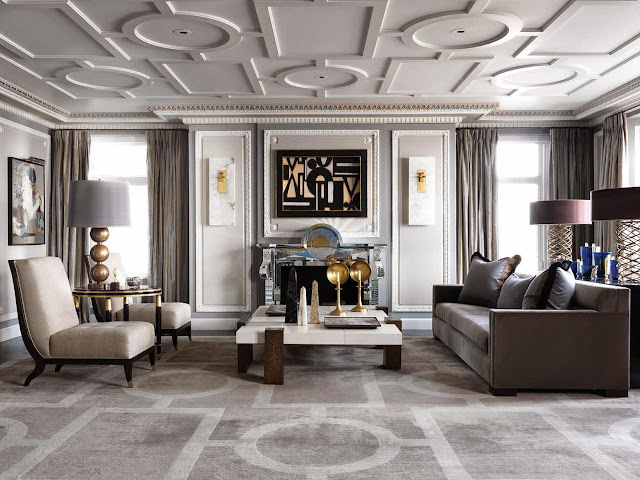 One personal favorite text: I transcribed a wide-ranging conversation with Jean-Louis on topics like lighting, carpets, paint colors, design conception, and the importance of getting the interior architecture right first. It’s essential and insightful expert reading. 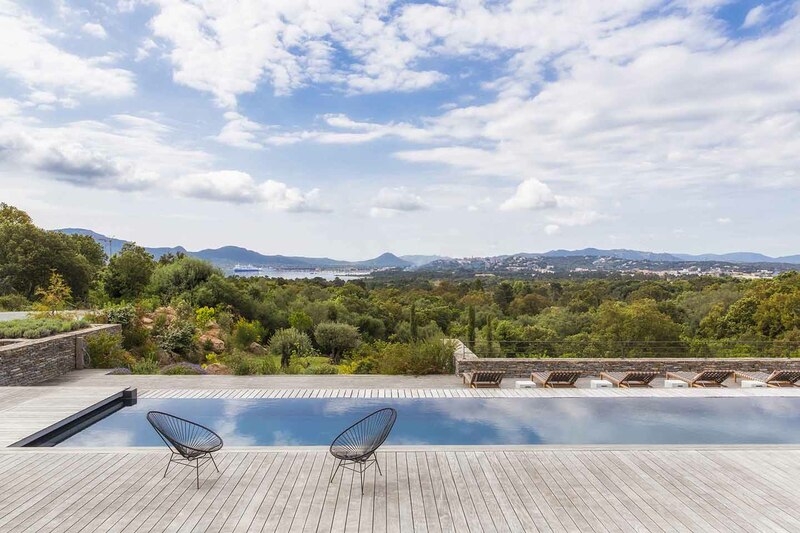 This week we’re off to Corsica to see his newest work there. 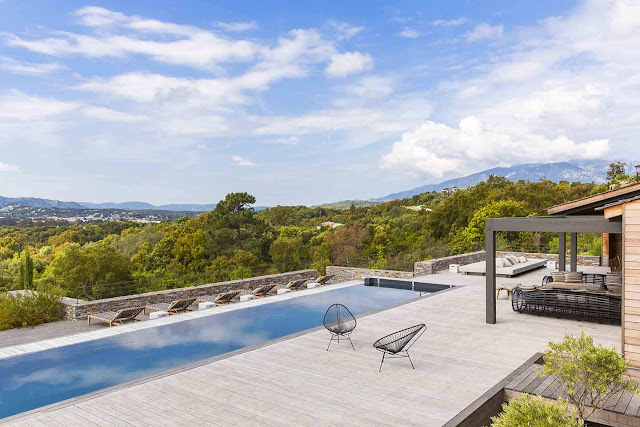 Jean-Louis Deniot recently completed a new modernist residence overlooking the coast of southern Corsica. 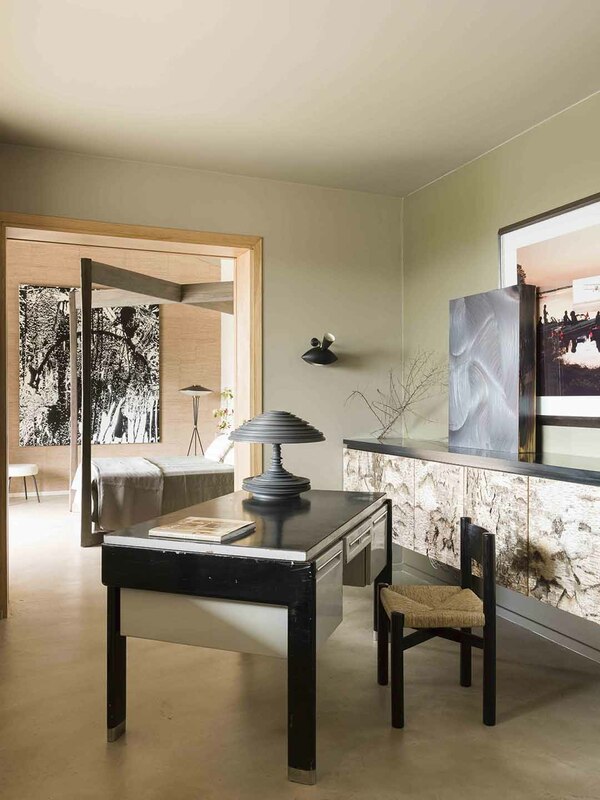 It’s the holiday retreat of a Paris art dealer—and designed with sensual teak floors, walls of locally quarried stone, limestone textured walls, and a global collection of custom-crafted and vintage furnishings. 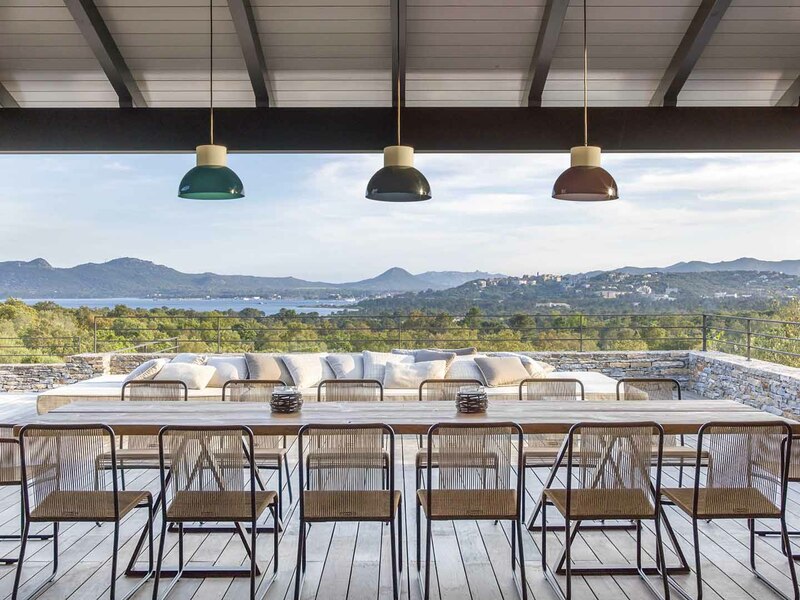 Outdoor sofas by Janus & Cie with Nomi fabrics, as well as Hans Wegner chairs, Charlotte Perriand bookcases, and superbly dramatic tables (indoors and outdoors) designed by Jean-Louis Deniot, give the setting and interiors distinction. Nestled into a hillside, the house and pool enjoy shelter, silence and privacy, with distant views of passing yachts and fishing boats. This southern Porto Vecchio region of Corsica is noted for its history, pirates, Romans, Saracens, remoteness, wild scenery, total privacy, and carefully controlled development. 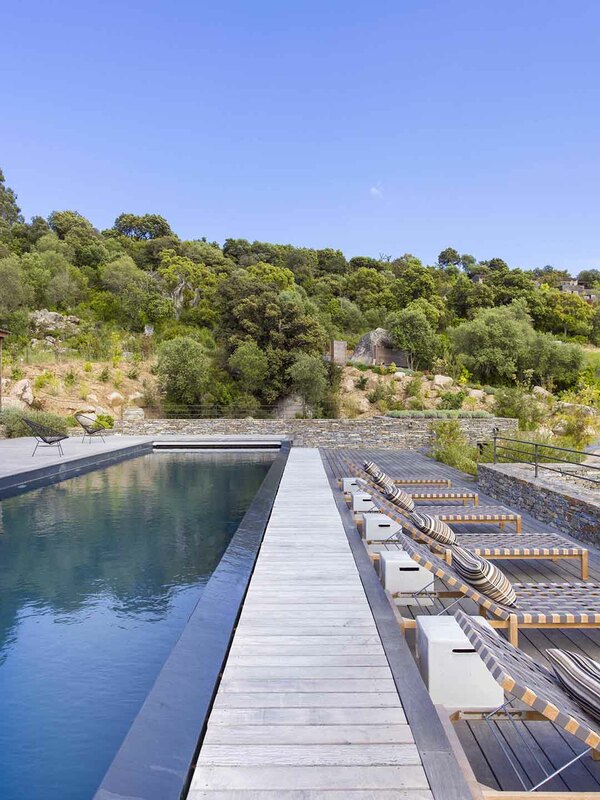 Hidden corners and somewhat inaccessible coastal outposts of Corsica have long been the preferred escape for leading Paris financiers and political figures, for artists and creative types, for the anonymity, and for the essential lack of glitz. Days are spent relaxing, swimming, and perhaps sailing. And there is always the excellent Corsican rustic cuisine, with its noted mountain cheeses, salubrious seasonal vegetables and fruit, and distinctive small-production regional red wines from ancient grape varieties. 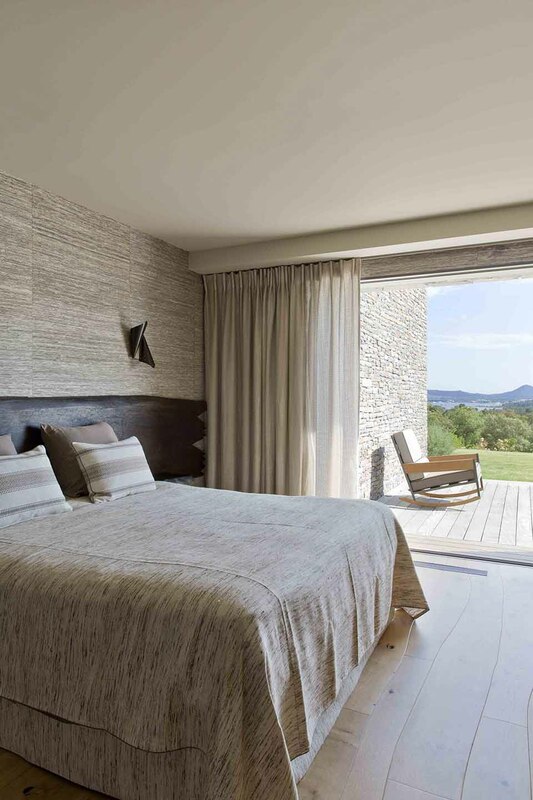 For the Corsica house, Jean-Louis Deniot selected a paled-down natural palette inspired by the rocky hillsides and natural vegetation of the region. 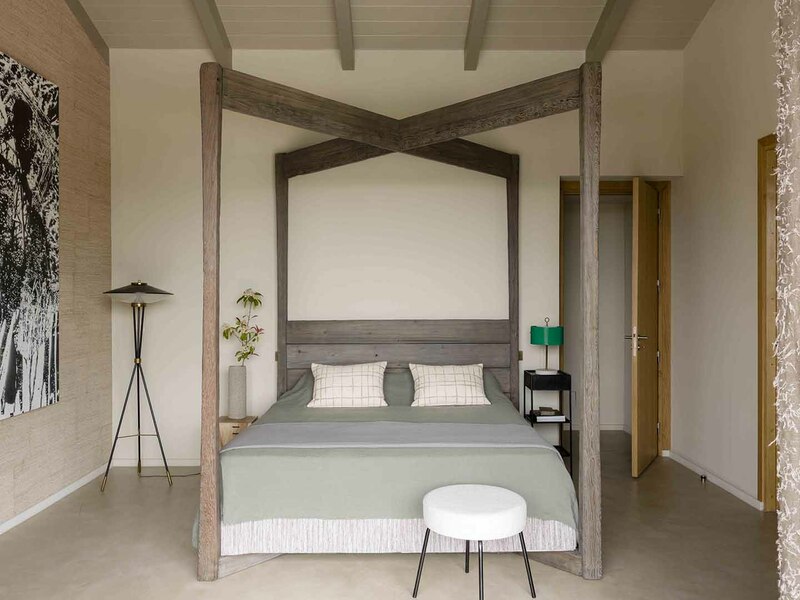 He designed the house for easy-arrival, easy-departure. 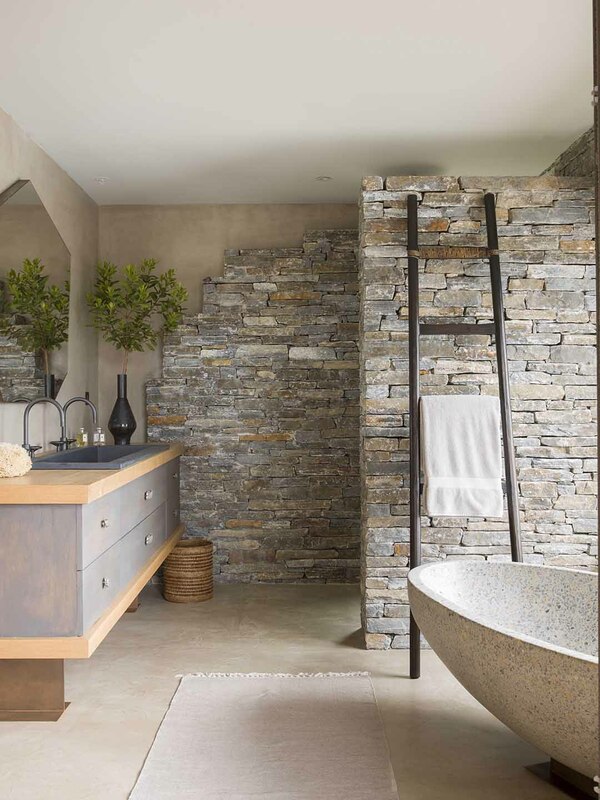 Chic and relaxed. On arrival, the owners throw open doors to the terrace and the house becomes one with the landscape and the Tyrrhenian Sea. 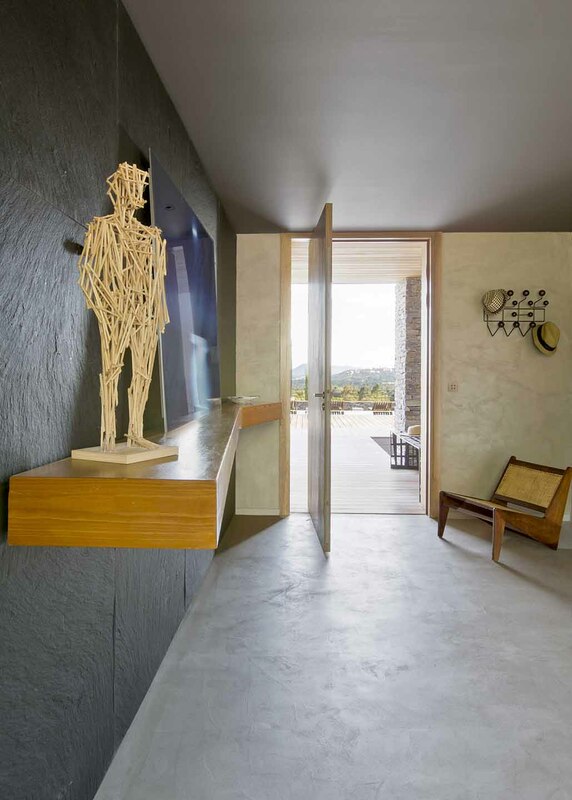 Paintings, sculpture and photography are presented throughout the house, as well as custom-designed indoor and outdoor furniture. The décor is designed for versatility and ease. 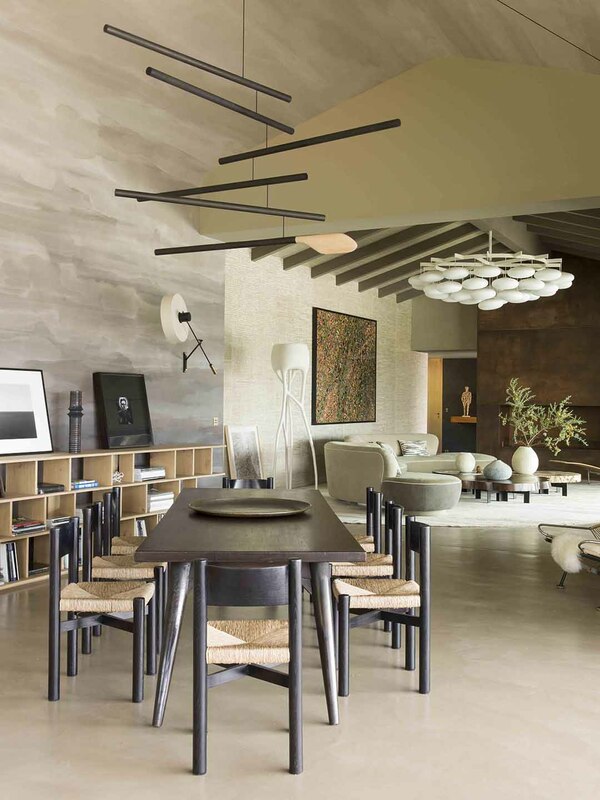 The dining tables can easily be used for the family—and then rearranged and re-purposed for parties and celebrations. It’s all very easy-breezy with low-key textures, soft-to-the-touch fabrics, and barefoot comfort that Deniot does so expertly. 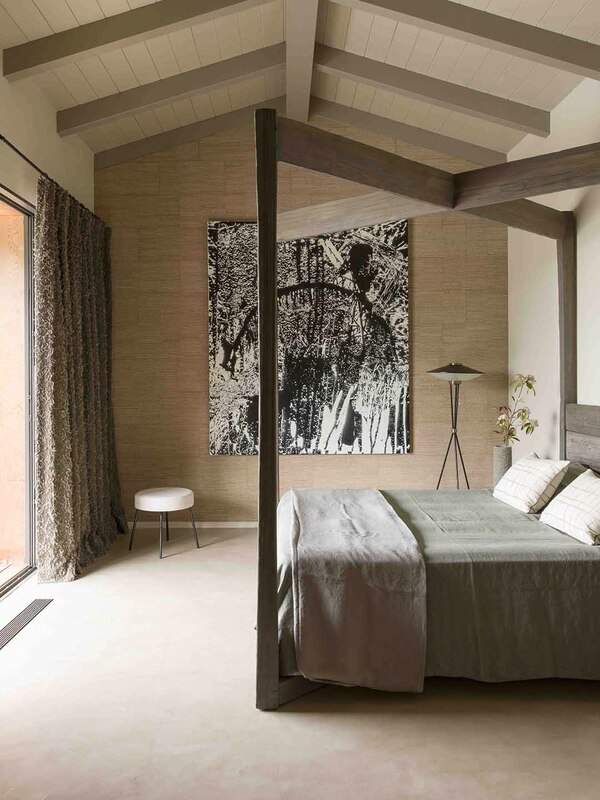 Jean-Louis Deniot said that he prefers to keep the textiles in holiday houses in a neutral palette and with natural fibers. Equally, the furniture is a mix of vintage pieces mixed with custom-designed tables, and custom-colored chairs and sofas. Tables are of a generous size so that family and friends can gather for drinks or congregate later in the evening to chat and relax. 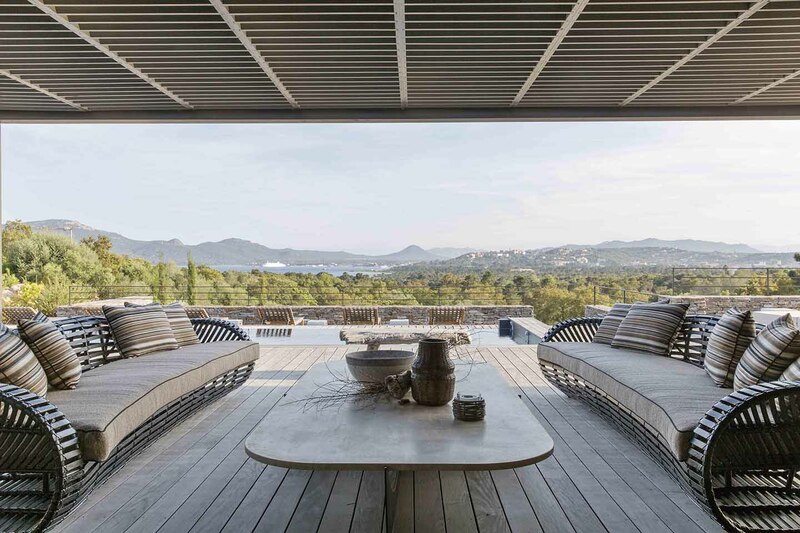 All images of the Corsica house published here with express permission. 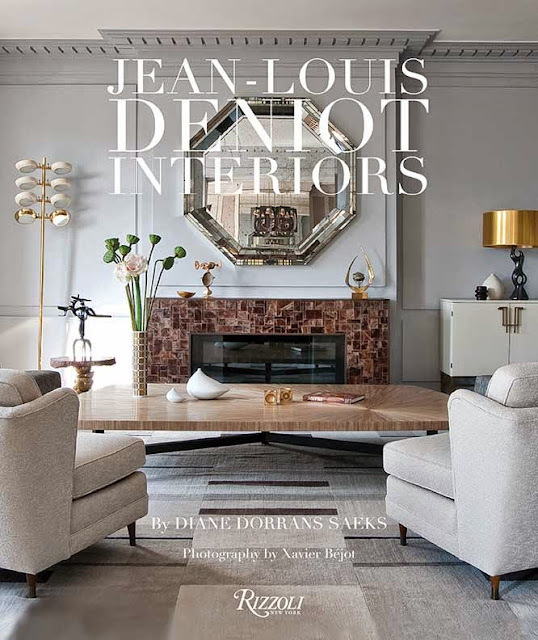 Image of ‘Jean-Louis Deniot Interiors’ cover and Alexandra von Furstenberg crystal box (from the studio of Jay Jeffers Design) by Diane Dorrans Saeks via iPad. 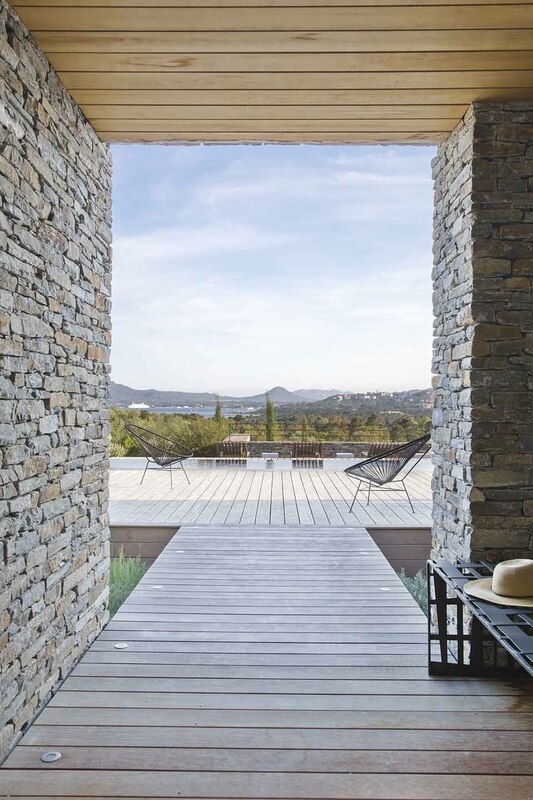 Corsica house by Stephan Julliard, www.stephanjulliard.com. 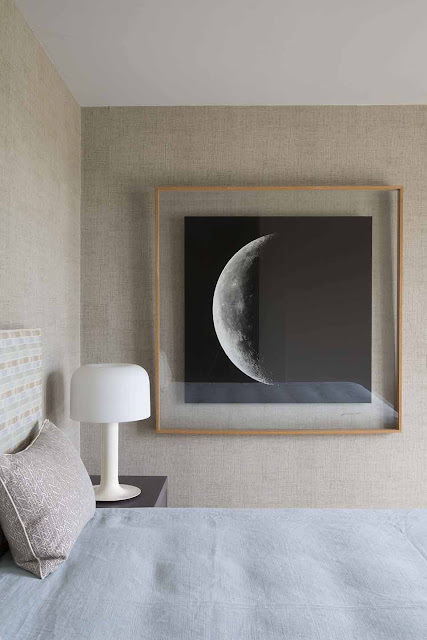 Stephan Julliard is a Paris-based photographer specializing in interiors and portraits. His career got off to a flying start when an image from his first shoot was chosen for the cover of the book, Dealer's Choice (Architecture Interiors Press). He has collaborated regularly with most of the world's leading design magazines: AD, Elle Decoration, Marie Claire Maison (Italy), House & Garden (UK), Belle (Australia), Ideat (France), as well as international editions of Vogue and Elle. He documents the projects of decorators like Jean-Louis Deniot and Kelly Wearstler, and accepts commissions from hotels, restaurants and boutiques. If there was a reincarnation in the 21stC of Jean Michel Frank, this man is him. 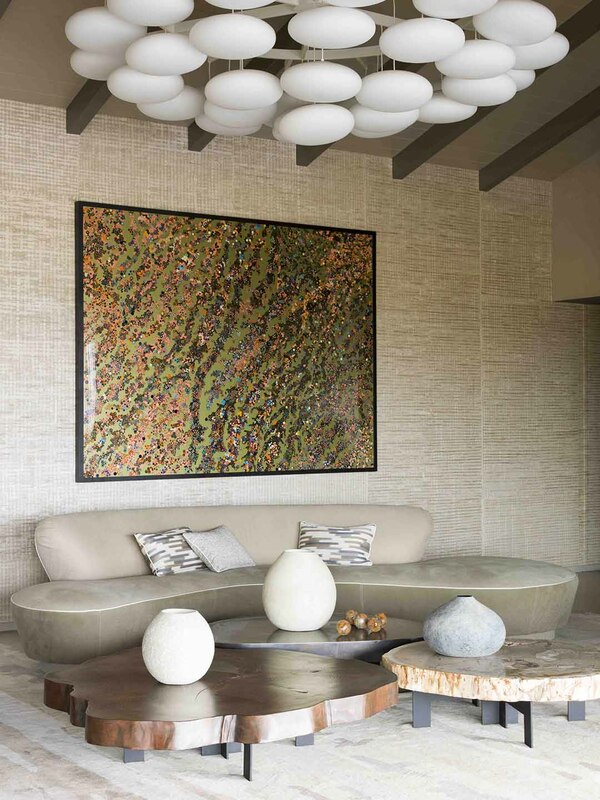 His furnishings, the palette of colors and textures are truly Masterful in their final execution! I predict his interior pieces surpassing their cost of today, in the auctions of years to come...not too mention the home with intact vision of furnishings - overbidding will rule the day! How very wonderful to hear from you. I agree about JLD….his eye is superb and his designs transcend time. Yes…his collections are superb and they get better and better. 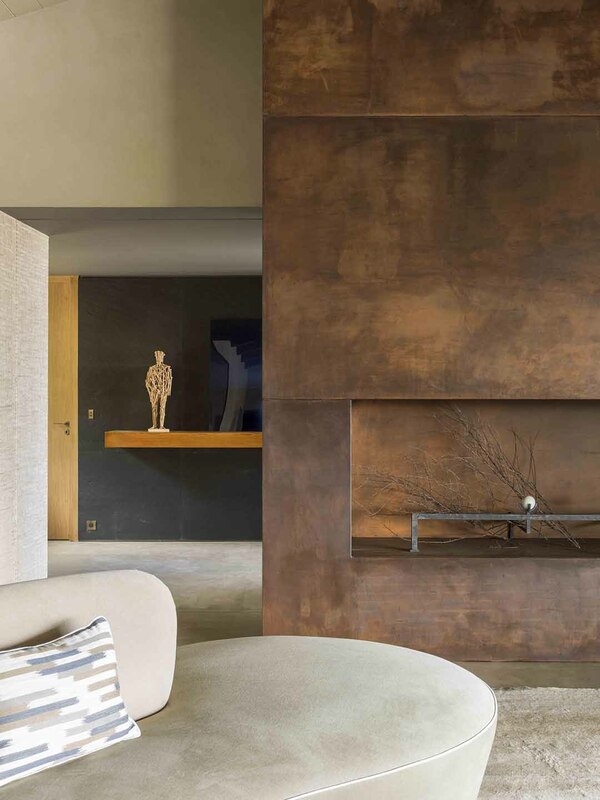 His own apartment…has exactly that look you mention and you hope it will stay exactly the same, all perfect. It's in my book…and you will note the painted glass doors int he dressing room…that look like onyx…or are they onyx?? that is his art. I received a lovely message from my dear friend Elisa Stancil--an incredibly talented decorative artist..and with her son James Stancil, founders of the leading decorative art studio, Stancil Studio, based in San Francisco. Elisa said, "Stunning, as always, Diane... Thank you for sharing beauty in these troubling times… Elisa"
Yes…that was exactly my point. Beauty endures. Beauty…we must always emphasize it and celebrate it and create it. I finally got to meet Jean-Louis in High Point this spring. Not only is he handsome and incredibly talented, he is also most charming and down to earth. The full package! Looking forward to much more from him.